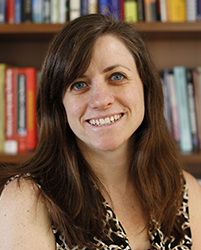 Emily Weinberg is a researcher focusing on K-12 education policy as well as early childhood. She currently serves as task leader for training for the child care observation and child assessment components of the Independent Evaluation of California’s RTT-ELC Quality Rating and Improvement System. Weinberg also serves as a research analyst on the Massachusetts Department of Early Education and Care’s RTT-ELC Validation of Educator Competency Study. On this study, she facilitates the advisory group meetings, develops and pilots surveys, and conducts observations of early education and care classrooms. She also led the document review task and contributed to qualitative data analyses and reports for the Massachusetts Wraparound Zones Evaluation for the Massachusetts Department of Elementary and Secondary Education. In addition, Weinberg contributed to qualitative data analyses for the U.S. Department of Education’s Study of School Turnaround and Task Order 14: Profiles of School Turnaround in Selected Sites. She has served as an associate recruiter, actively recruiting school districts to participate in the U.S. Department of Education’s Teacher and Leader Evaluation Systems study. Weinberg is skilled in quantitative and qualitative analyses, writing, recruitment for random assignment studies, and survey design, management, and analysis. Before joining AIR, Weinberg was a Senior Research Analyst with Berkeley Policy Associates, where her work focused on teacher effectiveness, early childhood education and care, and the use of surveys in evaluation. Prior to that, she was a research associate with the Education Statistics Services Institute at AIR, where she assisted with the National Center for Education Statistics’ Early Childhood Longitudinal Studies.